Kendare Blake’s debut YA horror novel Anna Dressed in Blood is the deliciously creepy story of a 17-year-old boy, the ghosts he lays to rest, and the girl he loves…who just happens to be dead. What does the author of such an unorthodox love story find romantic? 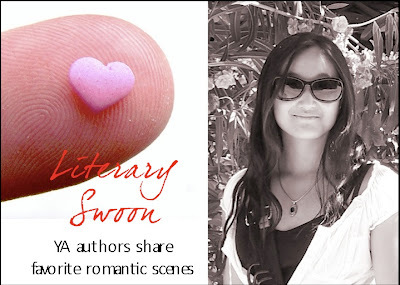 Kendare elaborates below for our Literary Swoon series! If you’ve ever felt unnoticed or nervous or lonely in the middle of a crowd, this book may hit all your buttons. I went staring through my bookshelves for this one. I don’t know if it’s my favorite, but it’s certainly memorable. This is the scene from Maeve Binchy’s Circle of Friends. The big, ballroom dance scene, where everyone is gussied up in their finest, and big-hearted, funny Benny is being noticed as a surprise beauty, rather than a barrel of laughs sidekick. Could it be, that the most sought-after boy on campus might actually look past her lip-glossed and svelte friends and see her? This is an excellent tale of first love, finding beauty that’s more than skin deep, and how getting what you want can be a double-edged sword. Kendare Blake is the YA author of the gothic horror novel Anna Dressed in Blood. Its sequel, Girl of Nightmares, will be released in August 2012. Stay in touch with Kendare through her website, blog, and Twitter. I lovelovelove this book and the movie that goes along with it. Unrelated to romance, Nan is one of the most horribly awful characters in fiction. Just thinking about her makes my blood boil. Another book I have not read! These authors are adding to my pile quickly! I haven’t read any books by Maeve Binchy. I haven’t read this book. I only read one Maeve Binchy book and it was so slow I couldn’t hardly get through it. That was YEARS ago and probably just a bad choice though. I remember that scene. I loved it. I loved Benny. She was SO easy to relate to. 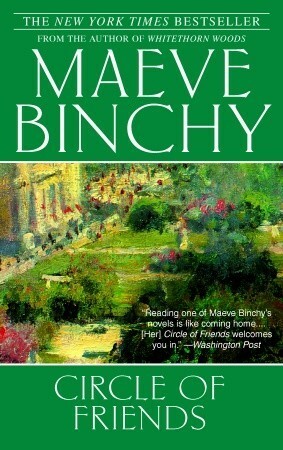 I am not familiar with Maeve Binchy but it sounds like a lovely read. Sigh the more I blog the more books I want to read. I need more time in the day. I am such a huge Maeve Binchy fan. I own all of her books and Circle of Friends was the first I read. What a great book! I loved Benny, she was such an “Everygirl”. Thanks for sharing the wonderful choice! Awwww, love when the hot boy chooses the “average” girl, gives us average girls hope:) Can’t wait to see what you have in store for Valentine’s Day tomorrow! Yay for more swooning! I loved Circle of Friends! Benny is one character I have never forgotten.